On Bob Dylan And Jonah Lehrer, Two Fabulists : The Record For a journalist, there's a code. If you follow Dylan's example, there's another way of operating. 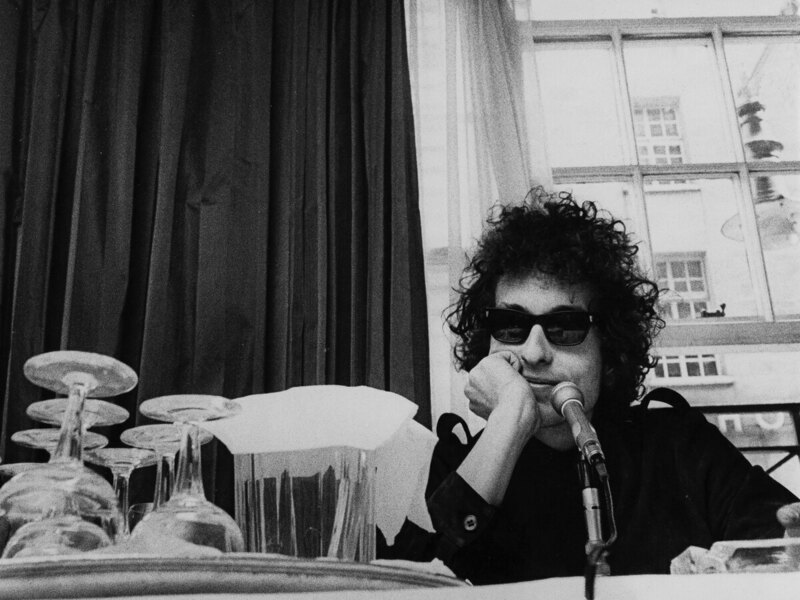 Bob Dylan at a press conference at the Savoy Hotel in London in 1966. This might be obvious, but the person whose quotes Lehrer made up, Dylan, fabricated characters and quotes in his own autobiography, lied about his upbringing when he appeared on the scene, steals all the time, and is celebrated as our culture's very definition of genius. Eric's observation inspired 20 or so responses, mostly from other writers, mostly insisting that Lehrer not be given a pass for a grievous journalistic misstep. The best-selling author fabricated quotes from one of the world's most-quoted artists — a reckless act that, to me, suggests desperation more than anything else. (How much time did his publishing company give him to write Imagine, I wonder?) He resigned his position at The New Yorker and, like other fallen stars from James Frey to Jayson Blair, has become an overnight example of what the pressure of stardom can do to young, smart minds. Yet there is painful poetry in the fact that rock's ultimate purveyor of what P.T. Barnum called "humbug" — "glittering appearances" and "novel expedients" — was the source of Lehrer's downfall. Before the Dylanologists out there attack, let me quickly add that I believe Bob Dylan is also one of the world's ultimate purveyors of truth. He's the greatest lyricist pop has ever seen (up there, anyway, with Chuck Berry and Cole Porter), and the living example of how to turn a Buddy Holly fixation into world-changing art. In the New York Times, Ben Sisario responded to the Lehrer scandal by writing that Dylan's "oracular, mysterious voice" has been the downfall of many who've tried to interpret him. To say Dylan is what my Bing Crosby-loving late father would have called a "bulls- - -ter" is not to underestimate his greatness. As Sisario's article suggests, one reason Dylan resists easy interpretation is because he's downplayed his own specialness over the years in order to shove off the burden of being overly mythologized. That hasn't stopped others from making hay of his every utterance. If only Lehrer had added something new to this pile. As music writing, Lehrer's analysis of Dylan's creative process is hackneyed; he regurgitates a story every Dylan fan knows without adding any particular insight. The quotes he falsely assembled are mostly just throat-clearing. Dylan's the victim of wrongdoing here, but he was hardly wounded in the scuffle. Maybe I'm wrong, but I've been imagining him having a mournful little laugh over this minor chapter in the long history of others trying to grasp his game. The history of people's attempts to understand Bob Dylan, which stretches back as long as the bard's own career, takes a few turns. Early advocates lauded him as a socially conscious game-changer. Later, followers debated his choices to go electric, get off the bus, go country, get religion, make indulgent art movies, explore reggae and record a bunch of Christmas classics. Most recently, following the publication of Greil Marcus' groundbreaking 1997 book Invisible Republic: Bob Dylan's Basement Tapes, it's become de rigueur to understand Dylan as part of the American tradition of self-made fantastical folk heroes. Dylan's been exposed — and happily exposed himself — as a semi-fictional character constructed from memories of Barnum's circus freaks, the caricatures of blackface minstrelsy and the ghost stories of the Wild West, as much as from "higher" sources like Walt Whitman or the civil rights movement. In Imagine, Lehrer focuses on the transformative moment in which Dylan penned "Like a Rolling Stone" — a process of inspiration and execution so overwhelming that the songwriter compared it to vomiting. "Vomit is the essential word here," Lehrer writes. "Dylan was describing, with characteristic vividness, the uncontrollable rush of a creative insight, that flow of associations that can't be held back." It was a life-changing moment for Dylan, one stressed in most accounts of his life, including Marcus' own short book on the song. And there's no doubt that at the time, Dylan felt like he'd done something new and profound. "I mean, nobody's ever really written songs before, really," he said in the same radio interview that included that colorful regurgitation reference. Yet by 1966 Dylan was already a major faker who lifted his original drawl from Woody Guthrie, his protective sunglasses from Roy Orbison — and his new artistic ambitions, arguably, from The Beatles. The phrase that Lehrer singles out as particularly original from the lyric, "You've gone to the finest school all right, Miss Lonely / But you know you only used to get juiced in it," is an unusual word choice that, according to Lehrer, serves Dylan's need to rhyme something with "get used to it" — and was common parlance for getting drunk in the language of the Beats and the blues hipsters from whom Dylan constantly and shamelessly borrowed. This is the essence of the popular arts in America: Be a magpie, take from everywhere, but assemble the scraps and shiny things you've lifted in ways that not only seem inventive, but really do make new meanings. Fabrication is elemental to this process — not fakery, exactly, but the careful construction of a series of masks through which the artist can not only speak for himself, but channel and transform the vast and complicated past that bears him or her forward. Integrity arises in the process of solidifying your relationship to those sources. For a journalist like Lehrer, there's a code, and he clearly violated it. An artist like Dylan shows us a different way of operating: of using insight not to shore up a myth of originality, but to connect to all the tall tales and ghost stories that establish a culture's character, to walk through a dreamscape whose atmosphere sticks to us and makes us who we are. Dylan himself described this process in a 1963 poem he wrote for his hero, another truth-telling, self-made character. "You need something to open up a new door / To show you something you seen before / But overlooked a hundred times or more," read the lines from "Last Thoughts on Woody Guthrie." In art, originality is never that original. But that doesn't make it less real.